This sale is over, but keep watching for additional sales and deals this holiday season. That means today is Cyber Monday and we are celebrating by having our biggest sale ever. Today only take 30% off everything on our site. That includes Geyser Cars, Microscopes, Science Kits, Insta-Snow, Robots and so much more. If you need some ideas, check out our Top 12 Gifts to put under the tree. You won’t go wrong with these fantastic educational toys. Skip the battery operated toys, the dolls, the cars and give the gift of science this year. 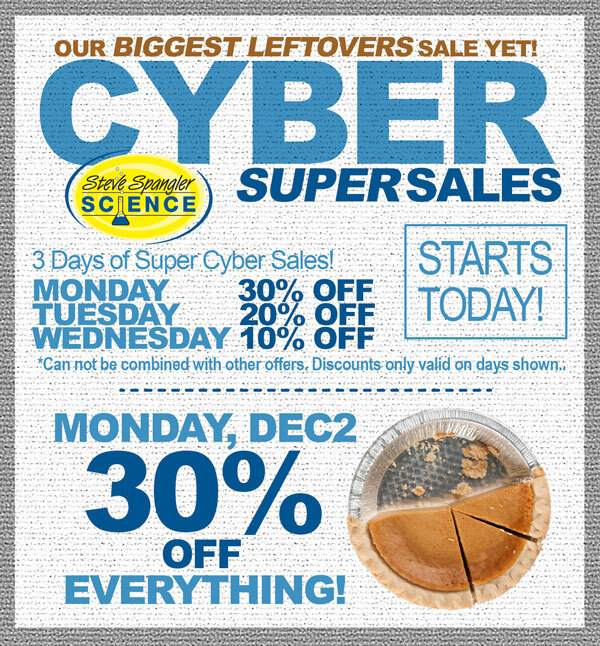 Don’t worry if you miss our sale today…we will continue celebrating by offering a few leftovers. Tuesday – take 20% off the entire site. Wednesday – take 10% off the entire site. I tried four times to place an order and each time I tried to check out the shopping cart went back to only one item. How can this be prevented? Hi Kathleen – I apologize for your frustrations with our website. Call our customer service team today 1-800-223-9080 and we will make it right. I will also alert our web team of the issues you experienced. Why is the 30% cyber deal over? It’s not midnight in Colorado. This discount code was from 2013. That is why it did not work. Our Black Friday discounts were listed on our home page.